We hope you were paying close attention to "What Went Wrong," Facebranch users. Because this social network can create significant problems in one's professional life. I kid. It was clearly a miniscule part of The Good Wife this week, but for a show that prides itself of being current and being hip - and which referenced Facebook earlier in the episode! - it was a bit distracting to have the featured case solved as a result of... Facebranch. That legal issue wasn't the only confounding aspect of the 2011 finale. I'm not sure if the show knows what to do with its main character these days. A week ago, Alicia was panicked over Grace's purported abduction, questioning herself as a mother along the way. Now, thanks to a few words of encouragement from Diane, she's on board as a future partner? She's willing to "focus" and to cut down on her "distractions," even when those distractions concern her children? I don't buy it. I don't believe the Alicia we know would commit so fully to a track that would result in even less time at home, especially not based on Diane's speech. Females should stick together to be successful! Girl power! Let me help you! Look, Diane and Alicia are two very different women. They have different priorities. Alicia is a parent of two and Diane chose work over time away with Gary Cole's awesome Kurt McVeigh. I'm not judging either, and I'm not interested in getting into a grand discussion over whether or not women can "have it all." 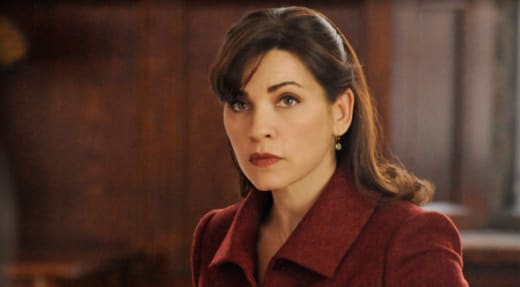 I'm just looking at the facts and the character of Alicia Florrick - yes, she's been hardened a lot since we met her, but not when it comes to her kids. It's simply a fact that partners at huge law firms spent a majority of their time at the office... and I don't see why Alicia would choose that path. I'd go the other way. As I argued in the latest edition of Round Table, why not go work for Louis Canning? Be home earlier, remove the complications from dating Will. It's a win-win, not the "mess" Alicia characterized it as last Sunday night. Elsewhere, Kalicia appears to be getting back on track. The thawing of the relationship between Alicia and Kalinda wasn't exactly handled delicately - I'm never a fan of episodes that so closely mirror a character's personal and professional lives; here, Alicia just happened to work on the case of a woman who talked about her real friends... while she also just happened to be reminded of how Kalinda can often serve as one - but it's a welcome development. Alicia has shared drinks so far this season with Celeste, Owen and now Diane, but none result in the sort of fun conversations and bonding that we used to see between her and Kalinda. It made sense for Alicia to sever ties after the whole sleeping-with-Peter thing came out, but it also makes sense here for her to finally start to forgive. Even if it took a contrived baptism plot her to get there. Finally, we leave 2011 with a twist in Will's judicial bribery case: Peter is Wendy Scott Carr's target, a development that will hopefully move this plot along a bit. There hasn't been a lot to it so far other than Will looking concerned, but also standing by the lack of evidence in her case. But now we'll get to enjoy the (spoiler alert!) return of Carrie Preston as Elsbeth Tascioni, who will act as Will's attorney in what is bound to be an entertaining grand jury investigation. Thank goodness for Will, too. The guy needs something else to do now that no one is showing up for his Wednesday night basketball games (I was hoping to see him and new pal Eli going one-on-one, if only to see the latter outside of a suit). I'm not sure it's Wendy that scared him off, though. It may have been his ugly free throw shooting form. Who takes a jump shot as a foul shot?!? Come on, Will. Go home and find some new friends for your game. There must be some kind of social network out there that will make it easy to do so. 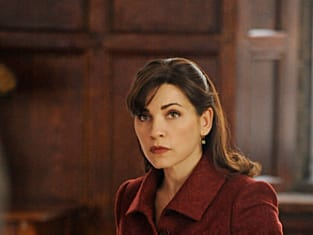 The Good Wife Round Table: "What Went Wrong"
The Good Wife Preview, Poll: What Went Wrong?